A controversial ultra-orthodox Israeli Rabbi has joined protests against the WorldPride march in Jerusalem. A demonstration is to be held today “against the sodomizing Amalek filth parade, who seek to defile the holy city,” Ynet News reports. 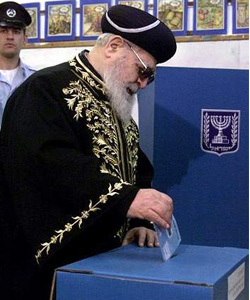 Rabbi Yosef is known for his controversial views, at the last Israeli election he told the electorate that they would go to the Garden of Eden if they vote for his party, or to hell if they don’t. Last month, the Jerusalem police, State Prosecution, the Jerusalem Municipality and gay rights groups agreed that a gay pride march could take place on November 10. Yitzhak Weiss, a journalist and spokesman for Edah Haredit, the ultra-Orthodox anti-Zionist rabbinic organisation based in Jerusalem, told The Jerusalem Post that the parade should be prevented in the name of peace. The Jerusalem Municipality will coordinate the necessary preparation for the event with organisers and the Jerusalem police overseeing security. Jerusalem Open House and the Association for Civil Rights in Israel petitioned the High Court on September 10, after police failed to answer a letter by the gay advocacy organization offering six different dates on which to hold the parade and asking the police to choose what was most convenient for them. Open House originally intended to hold an international gay parade in August. However, it called it off, of its own accord, because of the conflict in Lebanon.